European scientists have combined two proposed missions to study dark energy from space into a single project, named Euclid. 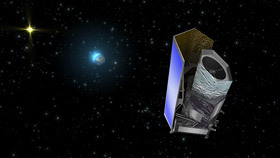 The mission, which is scheduled for launch no earlier than 2020, will combine two major techniques to look for dark energy. The second technique is known as baryon acoustic oscillations, and it looks at the imprint of sound waves from the early universe. Scientists say the mission will produce a 3D map of about 500 million galaxies at distances of up to 10 billion light-years from Earth, as well as measuring the motions of each of these galaxies. 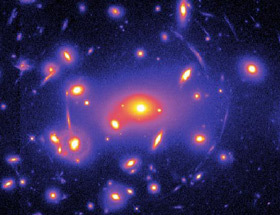 The locations and motions of these galaxies would allow astronomers to chart the changing expansion rate as the universe ages, revealing the nature of dark energy. Euclid will use a 1.2-meter telescope and digital detectors that are sensitive to both visible and near-infrared wavelengths of light, which are just below the range of the human eye. The light of distant galaxies is “stretched” to longer wavelengths by the expansion of the universe, which means they shine stronger in the infrared than in optical wavelengths.